Let's start first with the data and the facts. 1. More than 310 soccer players from Israel's top two leagues signed a petition calling on Prime Minister Binyamin Netanyahu not to "amend" the law that would require them to desecrate the Sabbath if they wanted to be soccer players. If you don't count the irrelevant foreign players, you will reach a huge percentage of soccer players who beg not to be forced to work on Shabbat. If you subtract the number of non-Jewish Israeli players, the number increases even further. 2. The High Court of Justice accepted the petition of the Movement for a Jewish and Democratic State, which claims that holding soccer matches on the Sabbath is against the "work and rest hours" law and the government must order the cessation of games on the Sabbath or to adjust the games to satisfy requirements through legislation or regulations. 3. The Prime Minister is interested in legalizing the games by exploiting the "hours of work and rest" clause, which states that the Labor and Social Affairs Minister is entitled to "permit the employment of an employee during the weekly rest hours, or part of them, if he is convinced that the cessation of work for all or part of the weekly rest may harm state security or cause damage to person or property, or cause significant damage to the economy, in a work process or fulfilling needs that, in the opinion of the Labor Minister, are essential to the public or to a part thereof." The law provides that a general permit for the sector "shall only be granted in accordance with the decision of a ministerial committee composed of the Prime Minister, the Religious Affairs Minister, and the Labor and Social Affairs Minister." 4. The news site News1 reported that the last time this ministerial committee met was 57 years ago, in 1960. According to a legal interpretation by the Legal Advisor's Office, there is currently no need for the approval of Religious Services Minister MK David Azulai of Shas, since the religious services office headed by Azulai is not the Religious Affairs Ministry that the legislator referred to, so that an atheist Prime Minister and secular Labor Minister will decide which branch is allowed to operate on the Sabbath without the consent of observant Jews. This stands in direct contradiction to the logic behind the law. 5. Holding soccer matches after the close of Sabbath does not harm state security or cause harm to person or property, does not greatly harm the economy (Fact: All basketball games take place on weekdays and many soccer matches take place after Shabbat ends). 6. Only five days ago, the State argued in the High Court that public transportation on the Sabbath is not essential. If public transportation is not essential (and there is room discussion regarding this), it is clear that postponing soccer games by a few hours does not harm any vital public need or any part of it. 7. In the past, all basketball games took place on Shabbat. For many years, none have been held on Shabbat and no one is asking or thinking about asking to schedule a game on Shabbat. In the past, all soccer games were held on Sabbath afternoon, and slowly some games were postponed for economic reasons to Saturday night and later to Sunday and Monday. 8. 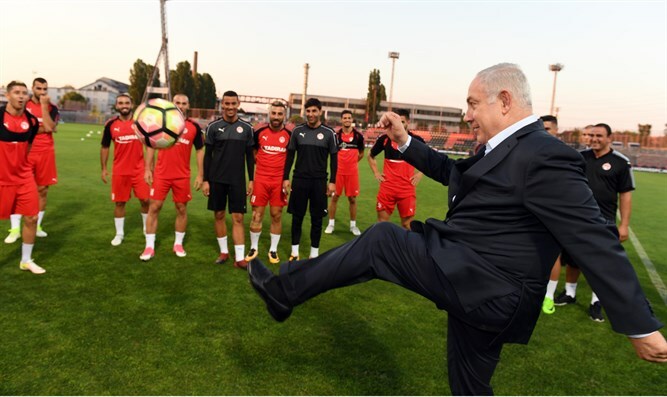 When Labor Minister Haim Katz follows Netanyahu's request, accompanied by the silence of the haredi and Jewish Home parties, and amends the law to define soccer matches on Sabbath as a vital need, he is not fighting for soccer, but rather is fighting for wealthy people who think they will thereby earn more money. He does not work for soccer players, but against them. They beg that he not oblige them to play on Saturday, but in the future he will force them: play on Saturday or face unemployment. He does not fight against religious coercion, but imposes secular coercion. It does not work for the benefit of soccer players, but denies them social rights granted them by law. 9. A survey of the "Sample Project Panel" of 2016 found that no less than 37.7% of the Jewish population in Israel does not travel on the Sabbath. Holding soccer games on Saturday excludes 2 out of 5 Jews in the Jewish State. No great Jewish pride. But when the government itself rakes in millions and millions directly and indirectly from the industry, this is a real disgrace. 10. Hundreds of football players who quickly signed the petition are brave. They are under a lot of pressure to keep quiet and not make trouble. Every player who signed this petition risked his livelihood and ability to support his family. Every player who signed the petition understands that he gave the team owners a significant reason to wonder whether it's worthwhile to employ the problematic player. 11. The chairman of the Jewish Home Party, Naftali Bennett, was silent and did not tweet on the subject, but his partner, Moti Yogev, approached him personally asking for his intervention, but he chose to ignore it. Moti Yogev also published this in the media, yet Naftali maintained radio silence. Rabbis whom the party claims to consult have urged Naftali to intervene, but the thunderous silence continues. On Saturday night, soccer players sent notices to Naftali's phone, but they said he did not respond at all. Their anger at Bennett is tremendous. They do not understand how he lets the decision pass and treats them like non-entities. 12. I do not agree with the half-silence of haredi MKs, but I can understand where it comes from: If they fight against soccer on Shabbat that does not concern most of their constituents, the act would appear to be religious coercion that would play right into the hands of Yair Lapid. The silence of Jewish Home and its members in a party that pretends to represent the religious and traditional public while opening its ranks to new constituencies is a disgrace. 13. "If Bennett allows this anti-Jewish decision to pass, let it be clear that he lost all of our votes," one of the senior soccer players wrote Saturday night. "What is his kippa worth, if our Shabbat does not interest him?" He asks angrily. Naftali Bennett continues to sit it out in front of the soccer players, but he has to remember that the voting booth has its own set of rules.